What is a CSJ Associate ? CSJ Associates are men and women, married and single, primarily Catholic, who seek a deeper relationship with the Sisters of St. Joseph of Carondelet without becoming vowed members of the community. Associates share in the faith community, ministry, prayer and celebrations of the Sisters. Associates make commitment to the Congregation. Our commitment as Associates challenges us to deepen our spiritual life while continuing our active lives as spouses, professionals, parents, caregivers and retirees. What does it mean to be a CSJ Associate? Associates are men and women, married and single, who seek a deeper relationship with the Sisters of St. Joseph of Carondelet without becoming vowed members. Associates share in the faith community, ministry, prayer, and celebrations of the Sisters.What type of commitment is expected of an Associate? What type of commitment is expected of an Associate? Associates participate in community meetings and celebrations as they are able. Associates can expect to be treated as partners in ministry, as companions on the faith journey, and as persons who extend our presence in the world. Associates live independently of the Sisters with no financial or legal commitment from either party. As an Associate, how may I participate in the ministry of the Sisters? Associates bring the spirit of the right relationship to their work as ministers in their local church, to their jobs, and to their families. They can also choose to participate as co-ministers in works operated by the Sisters of St. Joseph of Carondelet. What is the process for becoming an Associate? 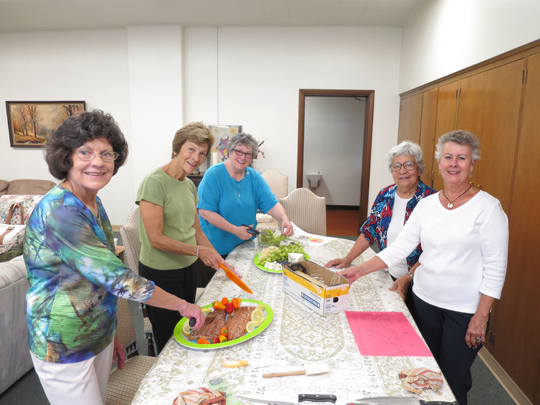 Those invited to Association enter a period of exploration, usually a year, during which they learn about the Sisters of St. Joseph and participate in both small group and larger community events. This is a time for asking questions, for reflective prayer, and for developing relationships with Sisters and other Associates. Some may find they are not called to Association, but the discernment process in itself is an important step in the faith journey of all who participate. How do I know if I am called to be a CSJ Associate? Any Sister or CSJ Associate can invite others to consider becoming an Associate. Individuals explore the call to Association through their experiences of the community during the orientation process, in relationship with Sisters and Associates, and by participating in community events. You are seeking to engage in a deeper, more intentional spiritual practice with others on the faith journey. You are looking for a faith-community with which to pray, minister and celebrate God’s presence in life. You desire to further social justice, particularly on behalf of the economically poor and unjustly deprived. You realize that life has a deeper meaning when lived in the context of reflection, shared experience and meaningful ritual. After completion of the orientation phase, candidates submit a formal application to make a commitment as a CSJ Associate. Following commitment, they enter into a deeper participation in the ministries, prayer, and activities of the CSJ community, both on a regional and a provincial level.